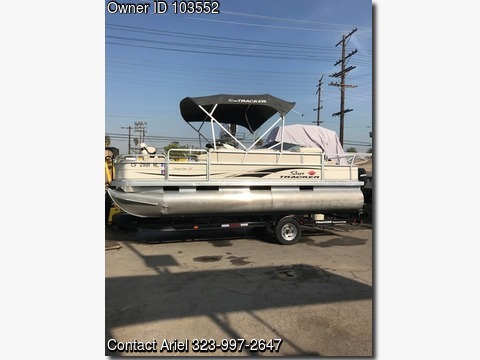 Boat is located in Marina Del Rey,CA.Please call 323-997-2647 with any questions...This Sun tracker comes with cover, fish finder and custom made trailer (worth $2000). The Sun Tracker Fishin' Barge 21 Signature Series pontoon masterfully merges outstanding value, family-friendly amenities and serious fishing features to create an exciting, inviting boating experience. Anglers love the lockable rod box, vertical rod holders, three movable fishing chairs, dual aerated livewells, tackle storage, and spacious casting decks. Switch instantly from "reelin' in the big ones" to "fun in the sun" with pop-up changing room, sundeck, L- lounge seating, removable table with drink holders, AM/FM/CD stereo with iPod connection, deluxe console with captain's swivel bucket, 36-quart cooler and 12-volt power outlet. This boat is a single owner boat and is priced WITH a single axle trailer. When not in use the boat has been store in a garage.